THE DEPARTMENT OF Foreign Affairs has confirmed that the State is releasing €3.92 million to Goal, following a US investigation into the charity’s operations in Turkey and Syria. Minister Charlie Flanagan said that the money was now being released after “an intensive process of engagement” with Goal, while Minister of State Joe McHugh said that additional funding for the charity for work carried out this year was “under consideration”. Problems emerged when some funding from the US government’s foreign aid agency USAid was suspended, after the agency uncovered potential improprieties in procurement practices in Syria, involving the charity. 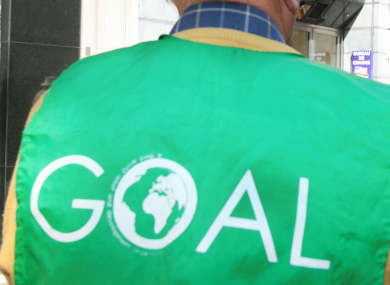 At least two of Goal’s workers in Turkey lost their jobs in the fallout from the investigation. The Irish government’s funding was withheld from Goal, pending the result of the US investigation. Commenting today upon the release of the €3.92 million in Irish Aid, Flanagan said: “We withheld funding to Goal due to the issues involved in a U.S. investigation of a number of NGOs regarding the procurement of humanitarian supplies for victims of the crisis in Syria. Following an intensive process of engagement with Goal we are now releasing €3.92 million to meet the cost of development programmes which were delivered on the ground in recent months. Flanagan added that the programmes were delivered in accordance with the original agreement between Goal and Irish Aid. McHugh, who is Minister of State for the Diaspora and International Development, added: “We are encouraged by the ongoing work of Goal to introduce substantial institutional reform. We continue our close engagement with Goal and we remain in contact with the US authorities and other international donors. Goal’s CEO, former Fianna Fáil minister Barry Andrews, resigned amid the controversy in mid-October. At the time, Andrews was keen to stress that Goal was not the only agency under investigation. He told RTÉ’s News at One: “USAid is investigating up to 25 agencies, but it’s important to remember that these allegations, broadly speaking, refer to collusion between suppliers in the region, with regard to the setting of prices and kickbacks received from staff. In a statement, Goal welcomed the news, describing it as “very welcome funding clarity” following “extensive engagement with Irish Aid and USAid”. Goal said it will remain in constructive dialogue with both USAid and Irish Aid regarding future funding. The statement continues: “The board of Goal is enormously grateful to all those who have supported the organisation over the last 40 years and in particular those who have continued to support it at this difficult time. Goal remains committed, more than ever, to our millions of beneficiaries around the world. TheJournal.ie has asked USAid for comment on the matter. Email “Government to give Goal almost €4m following investigation into financial irregularities”. Feedback on “Government to give Goal almost €4m following investigation into financial irregularities”.